Montana is home to open ranges, cattle drives, and cowboys and cowgirls who love the outdoors. Throughout the year, you will find PRCA Rodeos from your basecamp, Great Falls Montana. These events celebrate our heritage and allow spectators to enjoy an alluring, authentic, and rugged Montana tradition. 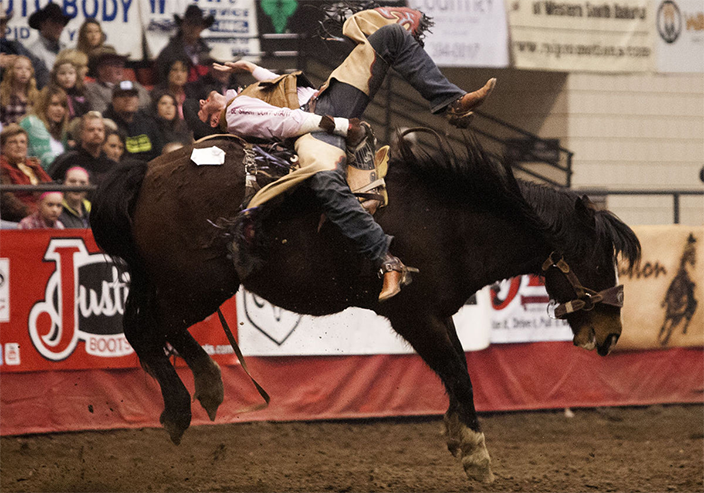 When the rodeo season draws to a close, cowboys, cowgirls, family, and fans head to Great Falls Montana in January to crown the years’ champions. The Professional Rodeo Cowboys Association (PRCA) is the largest and oldest rodeo-sanctioning body in the world. The Montana PRCA Circuit Finals are held in Great Falls, Montana each January, and the finals showcase the best of the best in Montana Rodeo. The contestants are men and women that have reached the peak of their profession and enjoy showcasing their talent. Be a part of the rodeo tradition under the Big Sky. Plan your visit to Great Falls during the annual PRCA finals to see cowboys, cowgirls, some of the best sportsmanship in the West, and the crowning of Miss Rodeo Montana. According to legend, rodeo began in the 1860s when two groups of cowboys met in Deer Trail, CO to settle an argument over who was the best at performing everyday ranching tasks. That was the beginning of a true American sport, based on the customs of those who settled the great American West. Spanish-speaking cowboys and recent east coast homesteaders contributed different techniques. By the turn of the 20th century, rodeo had cemented its place into American culture. As rodeo audiences grew, promoters organized annual contests in specific locations. The first true national cowboys’ organization emerged in 1936, when a group of cowboys and cowgirls performed at Madison Square Garden. Today’s professional cowboy honors the tradition of their 1800s predecessor, and the sport’s ideals of sportsmanship, showmanship, and mentorship are valued by today’s competitors. Be a part of this 150-year tradition. Plan your next great adventure to see cowboys, cowgirls, and some of the best sportsmanship in the West. All events are an easy drive from Great Falls.